The Estate Riding Permit Scheme offers permissive access to a number of rides through a variety of picturesque woodlands and bucolic farmed landscapes. 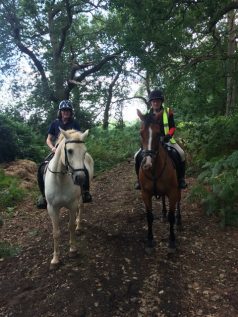 The route is accessible from a number of unboxing points and is designed to link up existing bridleways to enable a circumnavigation of the Estate for local riders. Membership is by annual subscription and applications can be made by the submission of the online form below, which also contains further detail on how the scheme runs. For further details please contact enquiries@hamptonestate.co.uk. An additional £25 p.a. per person over the age of 16 living at the same address . There will be no additional charge for up to 5 family members under the age of 16. Full responsibility for safety remains with the member. To pay the full amount in one instalment please send a cheque made payable to Hampton Estate Account to the address below. Alternatively you can pay by bank transfer. To do this please let us know by indicating your preference below and we will then email you details of how to pay by direct online transfer once we have received your application. NB. The annual subscription can be paid in two instalments by cheque only. The first instalment is payable on joining, the second half payable 6 months later. Please enclose a post-dated cheque (dated 1stJanuary 2019) to cover this. The annual subscription is non-refundable. If a horse is owned and shared by no more than 2 people, then the £100 annual subscription can be split between them and they can share this membership. Both riders should complete the application. On joining The Riding Permit Scheme for the first time, you will be sent a map of the permit scheme & a copy of the signed Agreement. We will hold occasional meetings with permit holders. I hereby confirm that I hold a Third Party Insurance Policy, which covers me for riding the permitted routes on the Hampton Estate. Riders will stay on the marked routes, indicated on the map. These routes might be altered, diverted or added to by the Hampton Estate depending on, for example, flooding, cutting of hay and game shooting in which case Riders will be notified . Gates must be shut carefully. The coloured bridle tag must be worn prominently. This tag is not transferable between riders. Dogs must not accompany riders, unless kept under strict control. The jumps on the routes are not to be jumped. Riders joining the scheme must be aware that there are ditches and rabbit holes along some of the routes and must take care. The scheme wants to encourage riders who ride with consideration for walkers sharing the same path and riding recklessly will not be permitted. The holder of the permit shall be held responsible for all claims and demands whatsoever on the part of any person whomsoever in respect of any injury, loss or damage, arising out of or in consequence of the exercise of rights and liberties given by this permit, and the Hampton Estate accepts no responsibility or liability whatsoever for any loss, injury or damage which may be occasioned to the holder of this permit or his/her horse and the acceptance of this permit shall be an acknowledgement that the holder accepts to observe these conditions and can withdraw if conditions are not met. Membership of the scheme is dependent upon paying your annual subscription.